Please join us for a morning of conversation and creativity in Düsseldorf in an inspirational atmosphere. 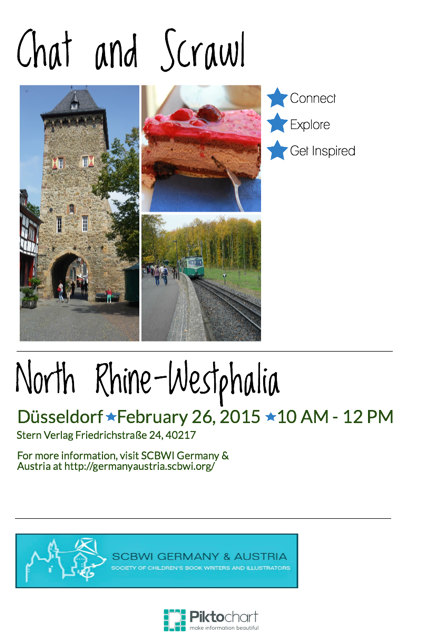 All writers, illustrators and SCBWI members are welcome to this first stop on the SCBWI tour of central Germany. Let’s discuss our current writing and illustrating projects, share goals for the new year, discuss ideas for our future gatherings and, finally, spend some time tapping into our creative minds with some focused scrawl time. Bring a current project you are working on or use the time to develop new ideas. post on the SCBWI Germany/Austria Facebook page. There is a coffee shop downstairs--right next to the children’s section. First off, Maria and I would like to wish everyone a Happy New Year and hope that 2015 will be the most creative and successful one yet. Members of SCBWI Germany + Austria are invited to join the Vogelweh Library's Write Club in a reading night on 18 February from 5:00 PM - 8:30PM at the Vogelweh Community Center in Kaiserslautern, Germany. The first fifteen people who sign up are welcome to read a portion of their work to the group (up to five minutes of reading) and receive written feedback (optional). Spaces are limited. To sign up write to healther.kerley@us.af.mil If you do not have access to the military base and would like to attend please write to Angela Cerrito CerritoSCBWI@gmail.com to make arrangements. The event is free. Writers are welcome to bring a guest or two and are requested to contribute to the shared potluck. For the second time, SCBWI regions in continental Europe are working together to bring you a conference packed with workshops, presentations and opportunities to share your work. Attend sessions that meet your interests, whether you’re published or unpublished, an illustrator and/or a writer. Optional activities include a Friday afternoon Scrawl Crawl through the old city center of Amsterdam, and a peer-critique brunch on Monday. Both are for writers and illustrators! Visit the website https://netherlands.scbwi.org/events/scbwi-europolitan-conference-2015/ for more information on faculty and registration. But hurry! Early Bird registration ends February 1st. As members, you know the Bulletin is certainly a proud staple of SCBWI, and a beautiful addition to our resource materials, but in this day of instant digital communications, it is no longer the most effective way to deliver news. As a result, the Bulletin will change from a bi-monthly publication to a quarterly publication. Commencing after the March/April issue, there will be four Bulletins a year: Spring, Summer, Fall and Winter. The Bulletins will carry feature content, columns, People, regional news, and in-depth magazine-style interviews. But the BIG NEWS is that in addition to the quarterly Bulletin, there will be a MONTHLY, ONLINE newsletter to all SCBWI members. This brand-new publication will feature breaking industry news, updates, tips, contests, success stories and trending topics. It will be a much more efficient way to keep members up to date on everything they need to know that might affect their careers and creative choices. While it will mean more work for SCBWI staff to gather and disseminate this information, we feel it is SCBWI's obligation, as the leading voice for writers and illustrators of children's books, to keep abreast of the news and get it out to our members in a timely and more frequent fashion. We hope you agree, and will enthusiastically support our new, monthly, digital newsletter. We are happy to announce that as of February 2, new boards will be added onto the SCBWI Blue Boards that will focus on the important topic of diversity in children's books. In conjunction with the non-profit organization We Need Diverse Books, SCBWI has developed the following categories: Diversity in Children's Stories, Ethnic and Cultural Minorities, Illustrating Diversity, LGBTQI, and Disabilities. If you are unfamiliar with the Blueboards, it is an online forum and chat center all SCBWI members can access from the main SCBWI website (http://www.scbwi.org). If you are logged in to your SCBWI profile you will be able to access thousands of topics ranging from SCBWI news to market and publishing news to tips from professionals. These boards are a vital resource for all our members and I hope you will take advantage of them. The Blueboards are just one resource for SCBWI members. Be sure to keep your profile up to date and submit your books to be listed in the bookstore. Or if you are proficient in your craft, submit yourself to be a speaker on any number of topics. All these topics you can learn more about when you visit the SCBWI website, http://www.scbwi.org/our-new-website/. And as a closing note, in light of the recent, horrific events in France, I like to remind you of the value of art. It opens our hearts to new experiences, new joys and yes even new fears. But only by confronting our fears will we be elevated to new heights. So my wish for 2015 is that all of you keep creating. No matter how hard it is or how many obstacles or fears you face. Keep creating because the rest of the world needs it.